For anyone looking to perform Umrah must firstly observe and follow strict guidelines in accordance with the Muslim faith, although Umrah itself is not obligatory such as Hajj it is an act of virtue and highly rewarded. Umrah can be performed almost all year round with no specific dates and no requirements to travel as part of a group, however there are certain times when you cannot travel for Umrah mostly during Hajj season and immediately after Ramadan and around 2 months after Hajj. Visiting Saudi Arabia for Umrah purposes requires a valid visa, there is no requirement to travel as part of a guided tour, Umrah can be performed if suitable flights are arranged allowing for a stopover if enroute to another country subject to meeting the visa requirements. The rites of Umrah are as below, please note it is up to each individual to ensure they are familiar with the process and strict formalities that need to be observed when performing Umrah. There are various online sources of information available to help with your Umrah planning, please refer to those documents to ensure you are fully aware of the obligatory requirements when traveling to Saudi Arabia for Umrah Purposes. Below are the 5 conditions which must be observed. In order to visit Saudi Arabia you will first need to obtain a valid Umrah Visa, it is also worth noting that due to construction works being carried out in Makkah the Umrah visa’s are currently on a quota system i.e. limited during certain peak seasons such as Ramadhan. Most UK airports offer multi faith prayer rooms and wudu(ablution) and wash areas making it easy for Umrah and Hajj passengers to accommodate their needs prior to their pilgrimage. Manchester Airport – Terminal 2 & 3 offer prayer room, changing room and Wudu Facilites. Birmingham Airport – Main terminal building next to departures have prayer room and wash facilities. London Heathrow – Departure terminals from 2-5 all have prayer room and wash facilities. Some special offer and discounted fares may not be available during peak seasons, fares advertised are correct at time of publishing. Please note: For Umrah you will require a meningococcal meningitis certificate which can be obtained through your GP practice or through a dispensing chemist on a private basis. Without the certificate you will not be able to apply for a visa. Disclaimer: Mushtaq Travel are not a tour operator and as such do not offer Umrah packages or sell Umrah Tours. 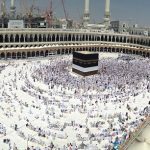 It is not a requirement to travel as part of a tour for Umrah pilgrimage although we highly recommend for first time Umrah travelers to visit the holy sites as part of a guided tour or group. Are you a business or company? Enquire today about our corporate account with Turkish Airlines – saving you almost 20% on all business class and premium economy class airfares.